This memory foam pillow moulds to the shape of your head and neck to provide support and comfort. It.. The Supreme Comfort Pillow pair contain luxurious hollowfibre fillings and have 100% Cotton cases to.. This quality luxury memory foam pillow moulds to the shape of your head and neck to provide support .. The Orthopaedic Support pillow pair contain twin convoluted foam pads for firm lasting support surro.. The Indulgence heavyweight luxury 1200gsm hollowfibre filled pillow feels like real down. It has a 1.. These pillows are made from nature, with a 300 thread Bamboo and cotton cover. Bamboo is naturally a.. 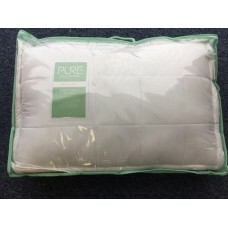 This top quality memory foam pillow impregnated with Aloe Vera moulds to the shape of your head and ..